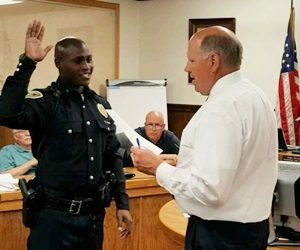 (WASHINGTON) - Washington's newest police officer Torrence McCollum was sworn in Tuesday evening by Mayor Joe Wellman. McCollum is a native of Ft. Lauderdale, Florida and attended Anderson College in Anderson, where he met is wife Christine Osha, a Washington native. The McCollums moved to Washington after the birth of their daughter. 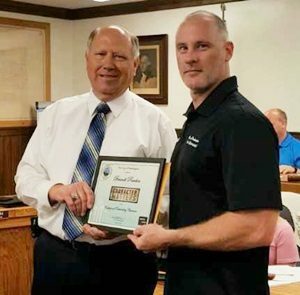 City Code Enforcement Officer Brandt Powden was presented an award to for showing initiative. Powden was nominated for the award by his co-workers.